Daily Grill Burbank is located off the lobby of the Marriott Burbank Airport and Convention Center, a popular destination for business and pleasure travelers. Our restaurant is just a few blocks from the Burbank Airport, the closest airport to Hollywood, the San Fernando Valley and to downtown Los Angeles. Validated parking is available to all of your guests with easy access to the restaurant entrance. Join us for breakfast, lunch, or dinner, or have a cocktail at the bar. 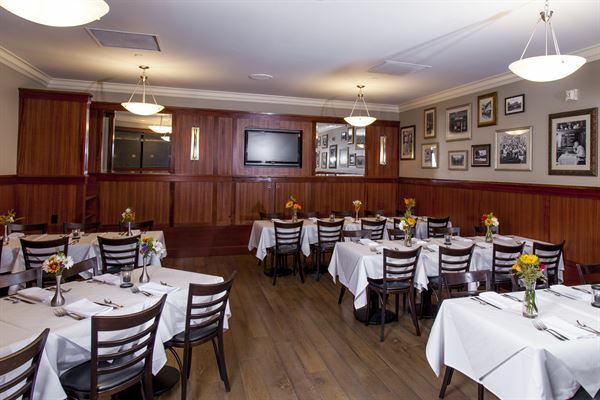 Daily Grill Burbank features a semi-private dining room that comfortably seats 43 guests, perfect for business functions or social gatherings. The large bar area can also be used for happy hour groups or an intimate cocktail reception before dinner. Open for breakfast at 6:30am, Daily Grill Burbank is ideal for those early morning business gatherings. The private room is equipped with cable television and AV hook-ups for your presentation needs. Plated Dinner | $45 per guest Buffet Dinner | $48 per guest Plated Lunch | $29 per guest Buffet Lunch | $35 per guest Please see attachments for additional information and menu options. While meeting friends attending a XENA convention at the adjacent hotel, I happened to go into The Daily Grill for a wonderful dinner. When it came time for dessert, my friend recommended the strawberry shortcake. It was ABSOLUTELY the best strawberry shortcake I had ever tasted - and I LOVE strawberry shortcake! I have even traveled to Burbank one time since first eating there, just to have the strawberry shortcake again. Awesome!